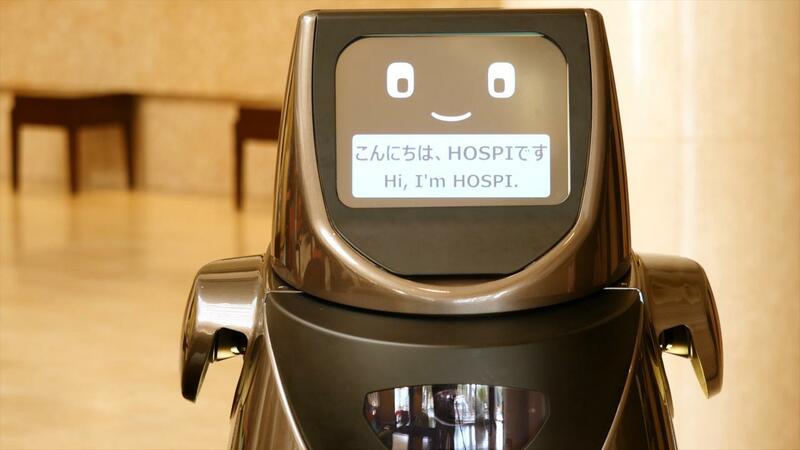 The new HOSPI robot from Panasonic will serve drinks to hotel guests. Family room at Hotel Henn-na in Japan has human touches and robot maids. Since HAL and his offspring, C-3PO and R2-D2, first entered popular culture, humans have grown accustomed to the notion of benevolent robots being trained to serve them. And while some high-end novelty shops have been selling household robots as a fun toy, most travelers had few practical examples of their utility. That’s rapidly changing as the travel and tourism industry embraces robots, experiments in AI, and robots’ capacity for machine learning to employ them. The leader in this is undoubtedly the Henn-na Hotel in Japan, where the entire staff is robotic, and an animatronic velociraptor mans the front desk. The hotel opened in July 2015 in Huis Ten Bosch, a Nagasaki theme park designed to resemble The Netherlands, to much fanfare. At that time, the hotel’s owner was quoted as saying he wanted to run “the most efficient hotel in the world” by having 9 out of 10 staff positions manned by robots. Rates are very reasonable in this very contemporary style hotel, and what’s new is that guests must pay extra for making beds, cleaning the room, and replacing amenities. Marriott deployed a 3-foot-tall, boxy gray robot named “Relay” made by startup Savioke at one of their Los Angeles hotels to help housekeeping. (Relay is currently in use at a dozen California hotels under various brand management.) According to reports, the hotel staff loads the robot’s storage with supplies, uses the robot’s touch screen to input commands, and sends it to various rooms where recipients will take towels, linens, amenities or whatever is requested. Starwood uses “Botlr” in similar ways at its Aloft barnd hotels. Hilton has been working with “Connie,” a much smaller countertop robot, at its Mclean Virginia hotel. Although based on Nao, a human-shaped robot commercially available through Aldebaran, Connie, named after founder Conrad Hilton, has been programmed with IBM’s Watson software so it can answers concierge style questions about local restaurants and attractions. No matter what you think about technology, robots are not necessarily taking jobs away from humans. Meet “Mario” as an example. A funnier looking robot built by Zora Robotics in Europe, Mario began working at the Marriott Ghent in Belgium. With a capacity for 19 languages, some humor and the programming to discuss the menu at the breakfast buffet, Mario proved so popular with guests that the hotel needed more staff to follow up on interactions with increased crowds. Just as robot used has increased enormously in industry, there are many other examples in action — in the travel industry — around the world. Are robots proving popular? According to a survey done by TravelZoo and presented at ITB this year, visitors from China are the most accepting of robots in hospitality, closely followed by Japanese, Brazilian and Spanish travelers. Globally, about 75 percent of travelers think that hotel porters and bellmen could be replaced by robots. In the U.S. and U.K., about 50 percent of travelers surveyed by TravelZoo said they would welcome a robot at the Front Desk, if it could answer their questions; acceptance rises if a human accompanies it to greet new guests. Which brings us to the Panasonic Corporation announcement that they will be experimenting with a new Autonomous Delivery Robot, “HOSPI,” this month at both Narita International Airport in Tokyo, and the ANA Crowne Plaza Narita airport hotel. Panasonic describes HOSPI as a robot which uses “preprogrammed map information, high performance sensors and an advanced collision-avoidance algorithm” to perform its duties without collisions. It’s cute too, as you can see in this video. The HOSPI prototype is currently in use in four hospitals in Japan and other countries for the delivery of pharmaceuticals and specimens. In the demonstration experiments to be conducted, the boxy, gray HOSPI, which has an internal storage unit, will have certain tasks. Travelers have an opportunity to see him in action from January 14-18, 2017 at the ANA Crowne Plaza Narita, 1F Lobby, where he will be offering bottled water to visitors and advising lobby guests of upcoming shuttle bus departures. From January 23-27, 2017, Panasonic ups the stakes by having ‘him’ retrieving used dishware in the airport lounge and offering drink service in the hotel lobby. Through these demonstration experiments, Panasonic says, they hope to accelerate the robots’ commercial development. If any of you get there, please let us know what you think.